Tonight’s dice inking project: a ruby Gamescience set I found in my dice box, and a big, beautiful Armory d30 Guy Fullerton​ gave me. I used an extra-fine point Sharpie white paint marker on these. Ultra-fine point is a great size because it fits the grooves on most dice perfectly, and it’s my inking weapon of choice. 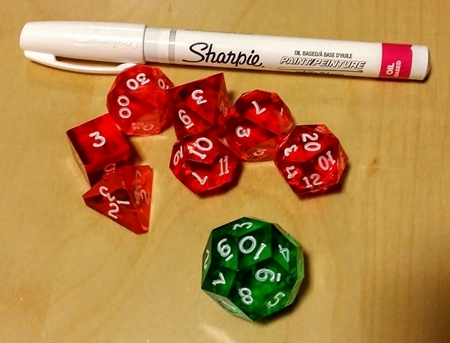 But as far as I know, Sharpie doesn’t make an ultra-fine point marker in white, and extra-fine point is as precise as it gets in the world of white paint markers. I’ve used toothpicks dipped in paint, and an ultra-fine point pilot dipped in paint before now, but the best success I have when recoloring dice (silver numbers don’t work well for me and some of my variegated dice need different colors on different faces to show my old man eyeballs what I just rolled) is just Liquitex medium viscosity paint, maybe slighty diluted with water but usually not, globbed on and wiped off with a paper towel. I’ve used whiteout too in extremis. My two oldest dice were both “inked” with paint, and they’re still holding up almost 30 years on. I’m pretty sure I used a toothpick, too! My personal blog, Yore, has been running since 2012 (with 255 posts) and is mainly about tabletop RPGs. You can subscribe to email updates or grab the RSS feed to keep up with new posts. In 2019 I started YoreWiki for tabletop RPG stuff, beginning with fantasy hexcrawl ideas. I use tags extensively on Yore posts for granular categorization and to encourage exploration. You can see all 893 post tags in one huge list. If you'd like to support Yore, use these links to shop on Amazon.com and DriveThruRPG, sign up for Amazon Prime, or get web hosting through DreamHost (my host since 2001). Thank you! I’ve gotten a ton of enjoyment and inspiration from these gaming blogs, often spanning many years.